So, what are indefinite integrals? When you learned derivatives you were supposed to solve the following problem. Given the function f(x), find the function F(x) = f'(x). With indefinite integrals we'll solve the reverse problem. And you would be right. The function F(x) is called a primitive of f(x). Is a primitive of f(x), where C is any constant. If we want to find all the primitives of a function, we just need to find one primitive. Then, all the other primitives will be the one we found plus a constant. The indefinite integral of a function is just the set of all the primitives of that function. This is a very simple idea, but we use a very fancy notation. This is read "the indefinite integral of f(x) with respect to x". The curvy symbol is the symbol for the integral. It was invented by Leibniz. Then we have f(x), the function we're "integrating". We use "dx" to specify the variable (x in this case). It will become clearer to you why we use these symbols, or even why we call this thing integral when you learn about definite integrals. For now, we'll learn how to find them. We found this using our knowledge of derivatives. And this is generally how we'll do it. And that's the first key. Every formula for derivatives is also a formula for integrals. You just need to rewrite it. This means that we can adapt our table of derivatives for it to become a table of integrals. We'll at least have a basic table. You can verify all of these formulas simply differentiating the right side of each equation. You'll get the function inside the sign at the left. You'll find a table similar to this one in your book. Or maybe your teacher gives you one. You'll be using it intensely. This is because of the definition of primitive of a function. And that is what we mean when we say that integration is the opposite operation to differentiation. This is important, because it allows us to say some interesting things about indefinite integrals. Inefinite integration is the opposite operation to differentiation. 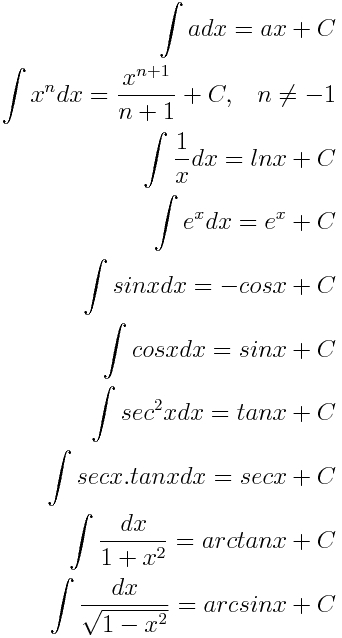 All derivatives formulas can be transformed into an integrals formula.